Rob Marshall’s new movie of the Stephen Sondheim-James Lapine Into the Woods has an insurmountable problem: the show it’s based on. The appeal of this musical, which mixes several fairy tales, has always eluded me. It contains an ingenious opening number in which Sondheim sets all the narratives in motion, and a couple of other songs (Cinderella’s interior monologue, “On the Steps of the Palace,” and “Agony,” a duet between Cinderella’s and Rapunzel’s princes) are OK if somewhat overworked. But the whole thing is too damn clever by half, with lyrics that tend to make the characters sound as if they’ve been reading self-help manuals. And by the time the show picks up again after intermission and the characters go back into the woods because their happy endings have begun to fray, the same fate has befallen Sondheim’s inventiveness. The very concept is stupid: if taking to the woods is a metaphor for coming of age, then no one gets to do it twice. And you don’t have to darken a fairy tale dark in order to modernize it; the Brothers Grimm and Hans Christian Andersen originals are plenty dark enough. Moreover, Sondheim’s idea of “dark” is, to my ears, merely homiletic: “Children Will Listen,” “No One Is Alone.” If I have to pick a revisionist fairy-tale musical, I’ll take Once Upon a Mattress. Revue-sketch comedy trumps pop psychology any day of my week. Marshall is a gifted filmmaker who’s been searching for another worthy musical since his astounding debut picture, Chicago. His next was Nine, in which he made the best of the cards he’d been dealt. But the wretched reviews suggested either that he was being punished for success or that his new detractors couldn’t distinguish between what writers do and what a director does. (I suspect both.) Nine, which was based on Fellini’s 8-1/2, is a lousy musical. So it was the first time around, in 1983, when Raul Julia played the Mastroianni role and it swept the Tony Awards; so it was the second time around, in 2003, when Antonio Banderas starred in the Broadway revival – though he was devastatingly charming in the role, and if someone was going to consign the musical to the screen, then he, and not the non-singing Daniel Day Lewis, should have been tapped for it. Even with that nearly disastrous casting decision, the movie of Nine was as decent as anyone could have hoped for with that material: it was beautifully directed, designed and shot, and the ensemble of women who surrounded Day Lewis (Sophia Loren, Judi Dench, Kate Hudson, Marion Cotillard, Penelope Cruz and Nicole Kidman) could hardly have been improved upon. Still, for obvious reasons, the movie wasn’t satisfying. For all its (unsolvable) issues, I think Nine showed Marshall off in ways that Into the Woods can’t begin to. In fact, there’s no way you can tell from watching Into the Woods that he’s more than just a hard-working hack shepherding a lot of familiar faces through the endless-seeming forest. (The cinematography, by Marshall’s usual collaborator, the wizardly Dion Beebe, is lovely.) Some of those faces do manage to create temporary diversions. Chris Pine plays Cinderella’s prince as a Harlequin Romance hero; he’s the funniest thing in the picture except for Johnny Depp as Red Riding Hood’s Wolf, reimagined as a lounge lizard – but unfortunately the Wolf has barely five minutes’ worth of screen time. Tracey Ullman as the long-suffering mother of Jack of the beanstalk (Daniel Huttlestone) and Anna Kendrick as Cinderella are both quite good, and Emily Blunt, as the Baker’s Wife, brings a touch of commonsensical wit to her readings that operates like a tonic. The very thought of Christine Baranski as Cinderella’s wicked stepmother makes you laugh the moment she shows up, and though the part is miniscule, she’s hilarious. But the role of the woeful Baker deflates the usually irrepressible James Corden, and there’s little point in casting the marvelous Frances de la Tour as the Giant if she’s made so big we can’t see all of her face in the same shot. (Anyway, didn’t she already play a giantess in a couple of the Harry Potter movies?) Lilla Crawford plays Little Red Riding Hood, a role she plays as written. If you like little girls who sound like they were born wised-up and belting, you’ll love her. 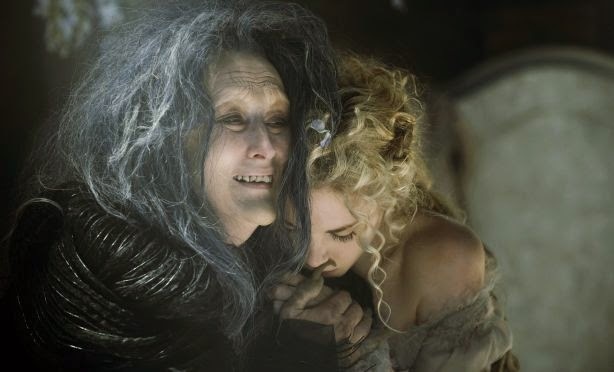 As the Witch, Meryl Streep makes her entrance blowing down the Baker’s shop door. That’s in the script; chewing all the remaining scenery isn’t. By the time she gets to her big second-act number, “The Last Midnight,” you may find you’ve developed a pressing need to visit the snack bar. Why would anyone have a hankering to play this terrible part anyway? When I saw the Broadway show in 1986, Bernadette Peters was cast as the Witch, and I assumed it was just loyalty to Sondheim and Lapine, two years after she’d starred for them in Sunday in the Park with George, that made her agree to do it. In Streep’s case, I assume it’s the usual: no one’s allowed to turn a hit play into a movie without giving her first dibs at whatever she imagines the showpiece role is. And if it turns out not to be, then by God she’ll huff and she’ll puff until she turns it into one. Pardon my mixing my fairy tales, but then, so do Sondheim and Lapine. 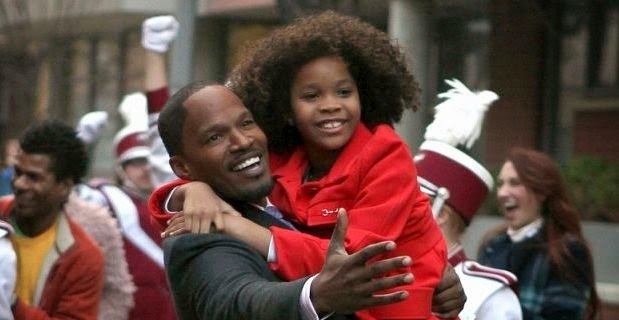 Jamie Foxx and Quvenzané Wallis in Annie. In this Annie (which Gluck, that busy little bee, co-wrote with Aline Brosh McKenna) the ten-year-old title character is African American and played by Quvenzané Wallis, the Oscar-nominated star of 2012’s Beasts of the Southern Wild. The billionaire who hosts her for a week and then finds he can’t live without her is Will Stacks (Jamie Foxx), a mobile-phone magnate who’s running for mayor of the Big Apple on a sort of no-New-Yorker-left-behind platform except that (as nearly everyone in the city seems to realize) he’s an elitist who couldn’t care less about anyone but himself. Having Annie move in with Stacks is the brainchild of his conscienceless campaign manager, Guy (Bobby Cannavale), whose opposite number is Stacks' personal assistant, Grace (Rose Byrne), a woman with a moral compass. At first it seems as if the four adult co-stars are competing in a bad-acting contest, but then Foxx and Byrne drop out. Foxx is the one person in the cast who actually looks at home in a musical and, once Gluck and McKenna stop writing Grace as a sitcom neurotic, the character reverts to the way Meehan wrote her (as sweet) and Byrne gets to relax. That leaves Diaz and Cannavale; it’s neck and neck for a while, but I think Cannavale wins in the home stretch. Watching him hit every dumb joke like a rube at a carnival slamming the hammer down at the Test Your Strength booth, I remembered Pauline Kael writing in her review of the 1969 Madwoman of Chaillot, “It may be a comfort to Edith Evans and Giulietta Masina that, having now given the worst performances in their careers, they can hardly go anywhere but up.” Cannavale hasn’t been around as long as either of those venerable ladies had, but I trust the same can be said of his work here. I gave up on Beasts of the Southern Wild after forty minutes; it was so hopelessly inept it felt like the director had never even been to a movie before. And nothing in Wallis’ performance made me think there was anything to gain by staying. In Huston’s movie of Annie, the little girl, Aileen Quinn, was shamelessly show-bizzy. Wallis is the exact opposite: she’s bland, she has blurry diction, and most of the time she doesn’t look much interested in what’s going on. The only time she breaks through is when she sings “Opportunity” at Stacks’ big campaign dinner. The song isn’t much better than the other new additions to the score, and physically she doesn’t do anything but sway from side to side, but she performs it with verve, and what has been up to now a pleasant, extremely light singing voice unexpectedly develops some dynamics. It’s the only moment in the picture I can honestly say I enjoyed. 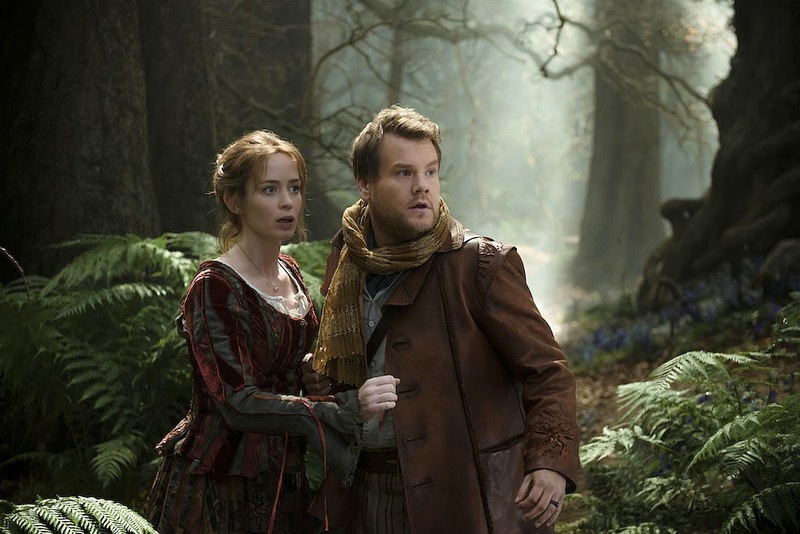 Otherwise Annie makes Into the Woods look like Singin’ in the Rain. "I assume it’s the usual: no one’s allowed to turn a hit play into a movie without giving [Meryl Streep] first dibs at whatever she imagines the showpiece role is. And if it turns out not to be, then by God she’ll huff and she’ll puff until she turns it into one. Pardon my mixing my fairy tales, but then, so do Sondheim and Lapine." -Brilliant, my friend! And uproariously funny!